Alexa is all over Vegas like an ambitious pimp. We don't think we've been to a press conference yet where Amazon's digital assistant hasn't been mentioned. If Alexa hasn't invaded your home yet, expect her to do soon in 2017. Amazon has launched some more Echo speakers then? No actually - Amazon is one of a handful of companies that hasn't actually got new Alexa-powered kit on show in Vegas. Amazon doesn't even have a booth at the expo. 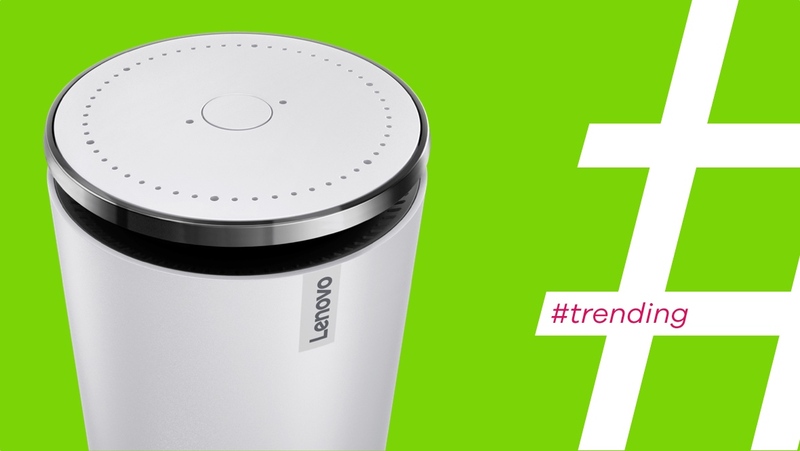 Instead, it was Lenovo who kicked off the CES 2017 Alexa love-in by announcing the Lenovo Smart Assistant; a cheaper-than-Echo Alexa powered smart speaker. The features are pretty much identical to Amazon's official Alexa speaker - so that's controlling music and smart home devices, requesting news and weather updates, getting calendar reminders and making shopping lists. UK company Emotech also used CES to reveal Olly; a donut-shaped speaker that spins around with lights flashing when active and Mattel took the covers off of Aristotle, its Alexa-powered speaker that's aimed at kids. So it's just speakers then? No sir. LG has Alexa squatting inside its new connected fridges. It's actually less bonkers than it sounds - not only does it mean a fridge that doubles up as an internet radio it's also a perfect place for Alexa to be when you need to tell her that you've run out of yoghurt. Or Fanta. Or cheese. Or other stuff you keep in the fridge that Amazon sells. Seiki, Element and Westinghouse (no, we haven't heard of them either) have all announced that Alexa will be baked into their 2017 smart TV range and Vobot has unveiled what it is calling "the first Amazon Alexa-enabled timepiece" by way of its sleep-coaching alarm clock. Anything less dull than fridges and alarm clocks? Ford cars. Exciting enough for you? Ford's big CES announcement was all centred around Alexa. Amazon's AI bot will be built into the Ford SYNC 3 AppLink meaning you can control your car from your house and your house from your car. For example, you can get the ignition running in your car - and get the heating on - while you're finishing your coffee in the kitchen and, when driving home, tell Alexa to get the lights on and to turn on your smart kettle. Obviously, in the car she can do all the regular digital assistant stuff too - like directions, news headlines and traffic warnings. Exactly how many devices is Alexa present in? Shawn DuBravac, the chief economist for the Consumer Technology Association (the CTA run CES, don't you know) says that more than 700 Alexa applications will be announced over the four days of the show. Sure, that's applications rather than devices but it gives you an idea of the scope. And, even if Alexa isn't actually present in the device itself, she's there - in spirit - through the power of IoT. Just like in the Samsung POWERbot VR7000 Robot Vacuum that will clean up your mess if you tell Alexa (via your Echo, Dot or any other Alexa-packing device) to do so. Surely Amazon can't go unchallenged here? Microsoft's version, Cortana (which is actually one of the better smartphone-based assistants) will be built into a Harman Kardon speaker that's coming later this year and we're told by the Redmond giant that we should expect more Cortana-powered gadgets and appliances in the coming months as a result of the new Cortana SDK. Google Assistant made its non-smartphone debut in the just-launched Google Home speaker and there's plans afoot to get an SDK out to devs next year so it can appear on non-Google branded devices. Nvidia Spot, just announced in Vegas, includes a microphone and will let you speak to Google Assistant via the all-new Nvidia Shield TV. And, you know, don't count out Siri.